Armory featured on Virgin Steele tribute album! Our cover of “Love is Pain” is featured on the first ever official Virgin Steele tribute album, By the Gods: A Noble Tribute to Virgin Steele, which after years of delays has finally been released! This tribute album also features performances by Wizard, Iron Fire, Crystal Viper, Eternal Winter, and more! Released by Majestic Metal Records, By the Gods was supported by Virgin Steele’s David DeFeis who wrote exclusive liner notes in the 12-page full-color booklet. To get the album please go to Majestic Metal Records. Even though we recorded and mixed “Love is Pain” in 2009 and posted it on our myspace page, nobody probably saw it since who uses myspace anymore hehe? Thus to coincide with the release of this tribute album, we have finally made “Love is Pain” available to the general public on our official youtube channel. 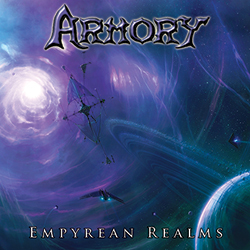 “Love is Pain” also appears as a bonus track on the Japanese release of Empyrean Realms. Hope everyone enjoys it!